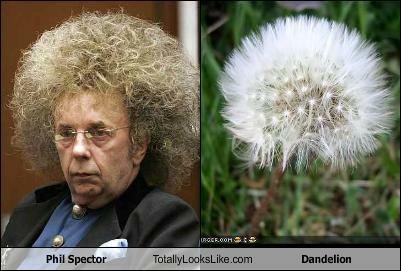 Warden Humhphrey Chiztoner had stated publicly that additional security measures have been installed around convicted murderer Phil Spector. “Phil is a cagey one,” said Chiztoner. “His head germinates in the early spring and there is a good chance that he could simply blow away. The “Wall of Sound” reference was made because Spector invented a recording technique with that name. Instead of using on or two instruments, he used dozens and layered these sounds on top of each other on multiple audio tracks. It creates a great sound that’s loud and rich. Beginning in early March, Spector will have his head rubbed vigorously with these chemicals in the hope that he doesn’t up and blow away and start growing somewhere else — somewhere where there are guns and girls. CLAY AIKEN GETS HIS SWEATER CIRCUMSIZED --- ANGERS RABBI. TV CHEF LYDIA BASTIANICH SAYS, "BRENDAN FRASER AND ELENA KAGAN WERE SEPERATED AS CHILDREN."